Dane definitely 'won' the opening on this game, I think mainly due to (me not foreseeing) his pawn advance on move 9. He then miscalculated with his knight on move 24, allowing me to equalise piece-wise. As soon as I was looking slightly better (rook and king each, with me one pawn up), I offered a draw, which was accepted. I've played Dane a handful of times previously, only getting a draw and a win on one day - the rest he's won, so I'm happy getting a draw. 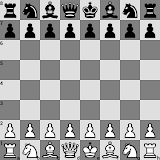 1.e4 e5 2.Nf3 Nf6 3.Bc4 d5 4.exd5 Nxd5 5.Nxe5 Be6 6.O-O Bd6 7.d4 Qh4 8.f4 O-O 9.f5 Ne3 10.Bxe3 Bxc4 11.g3 Qe7 12.Nxc4 b5 13.Ne5 Bxe5 14.dxe5 Qxe5 15.Qd4 Nd7 16.Qxe5 Nxe5 17.Nd2 Rfe8 18.Rad1 Rad8 19.a3 a6 20.h3 Rd5 21.b3 h6 22.f6 g5 23.Kg2 Nd7 24.Ne4 Rxd1 25.Rxd1 Rxe4 26.Rxd7 Rxe3 27.Kf2 Rc3 28.Rd2 Rc6 29.Ke3 Rxf6 30.Ke4 Kg7 31.Rd3 Rc6 32.c3 Kg6 33.g4 Re6+ Draw offered by black and accepted.